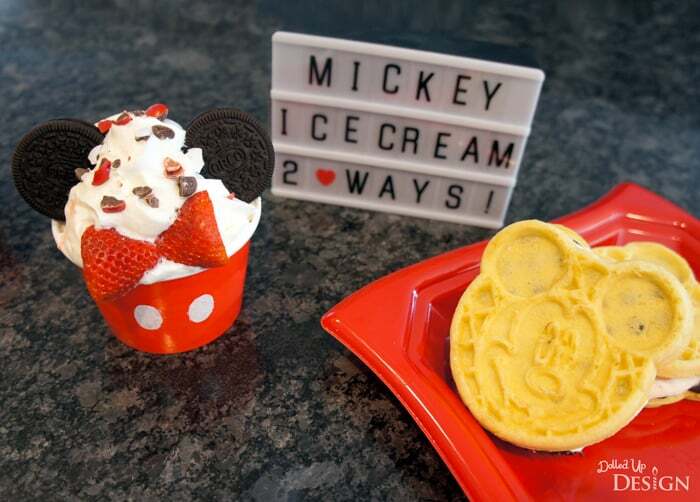 This Mickey Ice Cream Treats post is courtesy of our contributor Chantelle of Dolled Up Design…The weather has finally warmed up here and that has my kids asking for even more ice cream then usual. 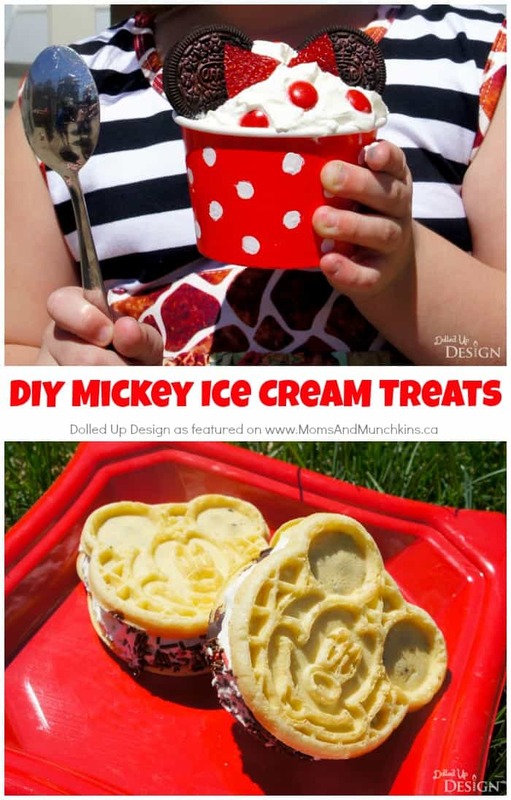 They love their frozen treats in all shapes and sizes, so I thought it would be fun to come up with a couple Disney inspired treats for us to enjoy this summer. Looking on Instagram often puts me into Disney withdrawals. 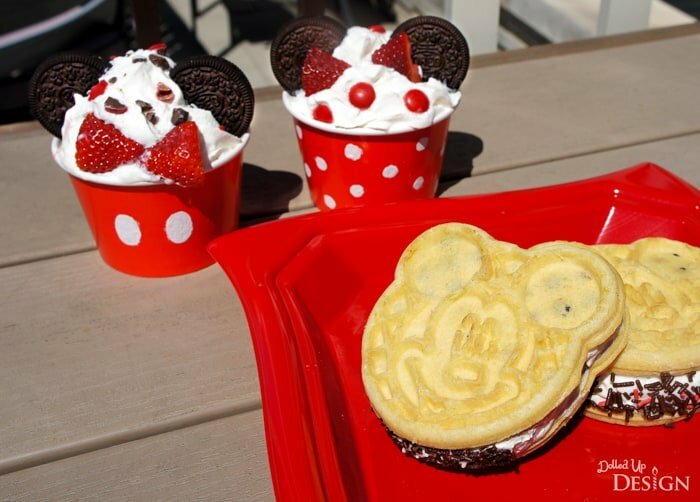 There is always something new and exciting to do or eat at the Disney Parks. 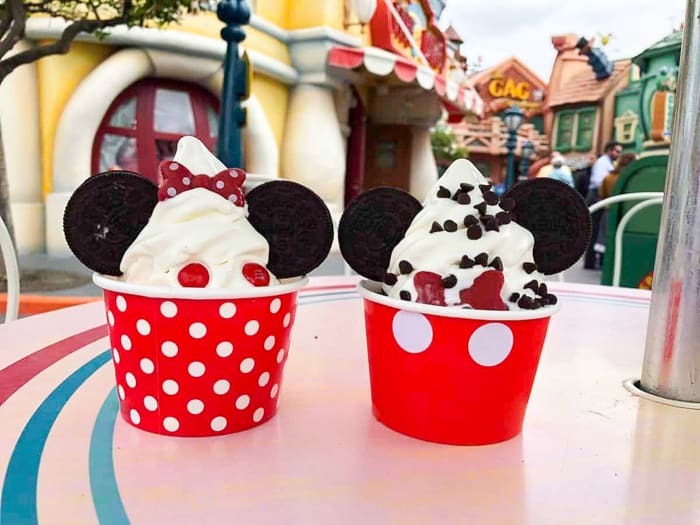 Most recently I saw Walt Disney World News Today shared these great Mickey and Minnie soft serve sundae cups from Clarabelle’s Ice Cream in Disneyland. 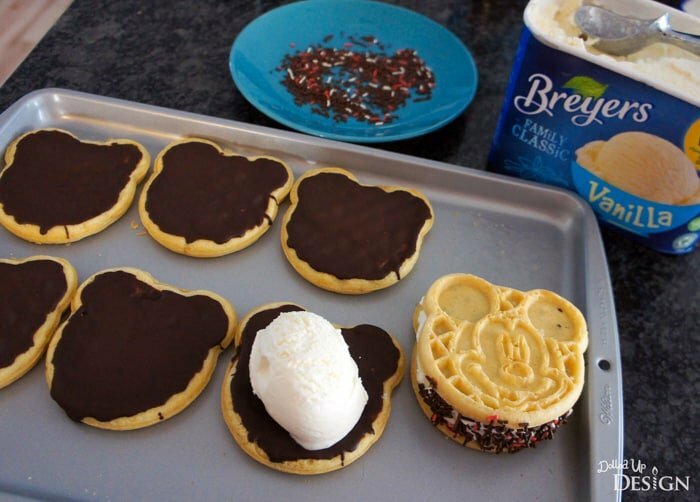 I knew they were something I could easily recreate to bring a touch of Disney magic at home. I got my paper sundae cups at Dollar Tree. I am happy to see they now carry a variety of colors and patterns for my annual ice cream social party. 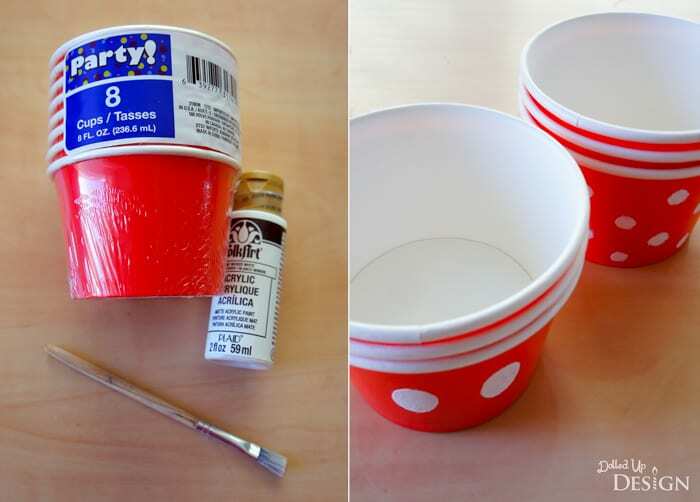 I grabbed the red package and some white acrylic paint to paint on Mickey’s iconic pant buttons and Minnie’s polka dots. From there, I just had to create my sundae. The original is soft serve, but I used a big rounded scoop of vanilla ice cream with whipped cream swirled on top to get a similar look. 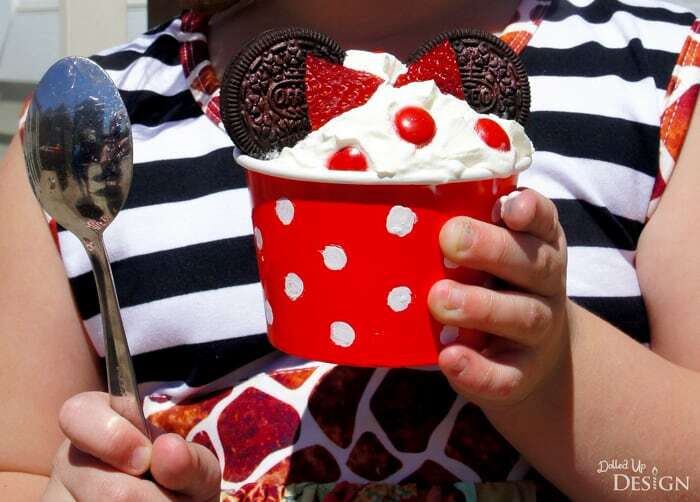 From there, two Oreos were stuck in each sundae to create the ears and red M&M polka dots were added to the Minnie version while Mickey got a scattering of crushed M&M’s. 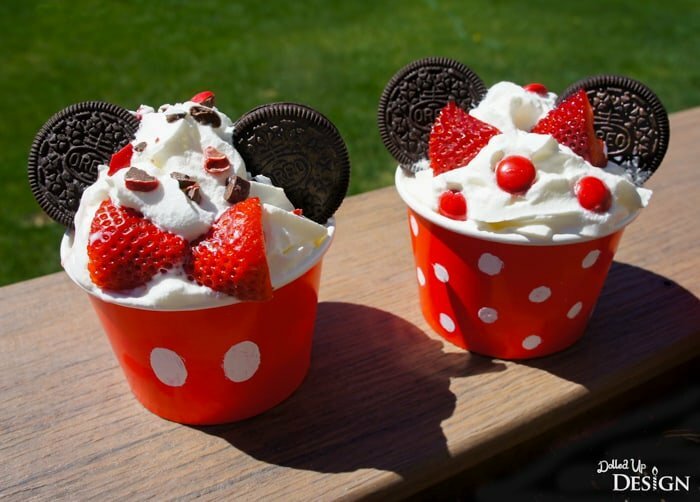 The original sundaes also had moulded chocolate bows – as a bowtie on Mickey and a hairbow on Minnie. It took a bit of thinking, but I decided the best way to re-create the red bows was to use a fresh strawberry sliced in half. 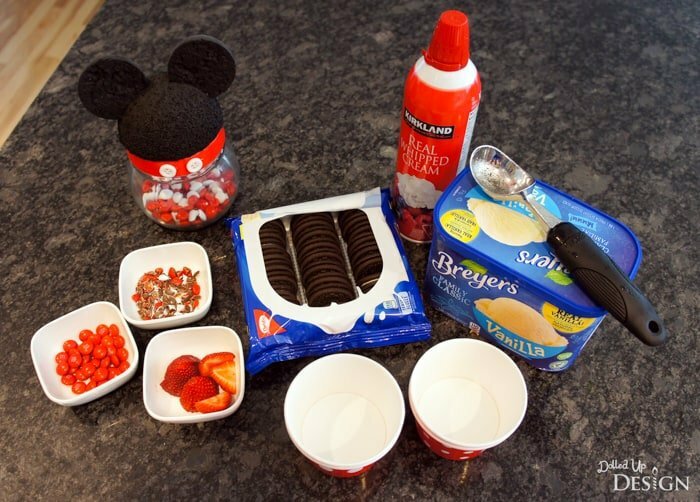 These Mickey ice cream treats were so simple to put together and turned out adorable. I think my versions are just as Instagram-mable and are a wonderful way to share a touch of Disney at home. My kids go through way more frozen waffles then I care to admit and enjoy them both toasted or straight from the freezer. 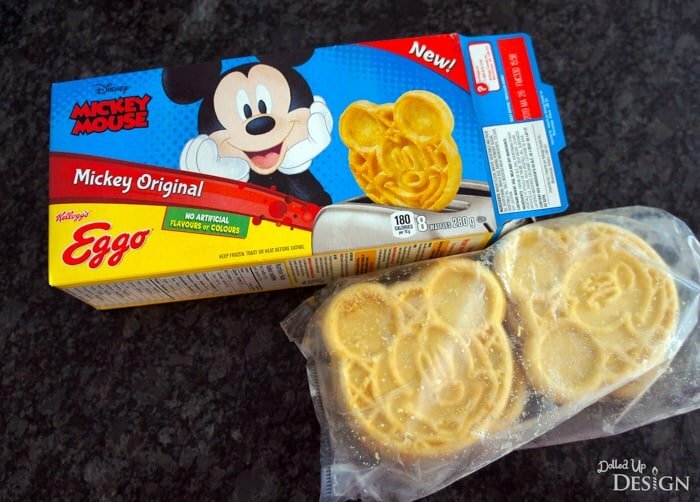 I was excited to see the Mickey shaped frozen Eggos finally available here in Canada but have been resisting the temptation to buy them because with the way we go through waffles it is better to buy in bulk. These ice cream sandwiches were the perfect excuse to finally pick up a box. To make the treats, I began by lightly toasting the waffles and then allowing them to fully cool on a cookie sheet. While they were cooling, I melted ¾ of a cup of semi-sweet chocolate chips + 1 tsp of coconut oil in the microwave, stirring at 30 second increments. Once the chocolate was nice and smooth, I spread it on the backside of each waffle and then popped my cookie tray of chocolate coated waffles in the freezer to set. While my chocolate was setting, I brought out my ice cream to soften. After approximately 15 minutes, I pulled my waffles back out of the freezer and put a big scoop of ice cream on half the waffles. I then put a second waffle on top of each to create my sandwiches. For an extra touch of fun, I also rolled the bottoms in sprinkles. 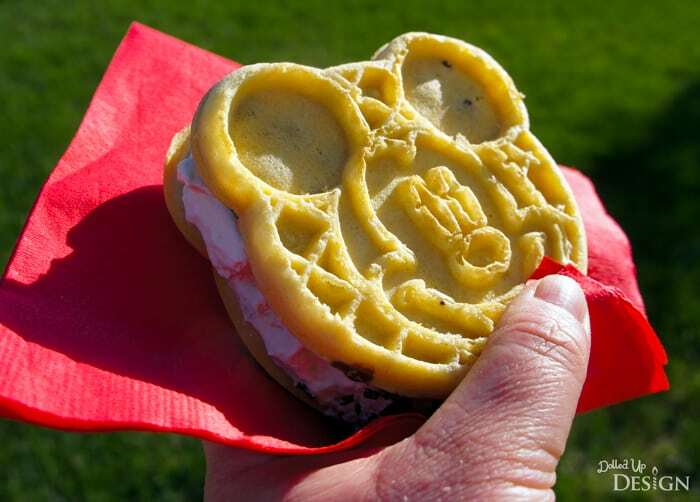 Aren’t these Mickey ice cream treats cute? The frozen chocolate layer added a nice crunch to the frozen waffles and the soft waffle paired perfectly with the vanilla ice cream. You could choose any flavour of ice cream and could even switch out the chocolate for melted peanut butter or caramel baking chips. Enjoy! 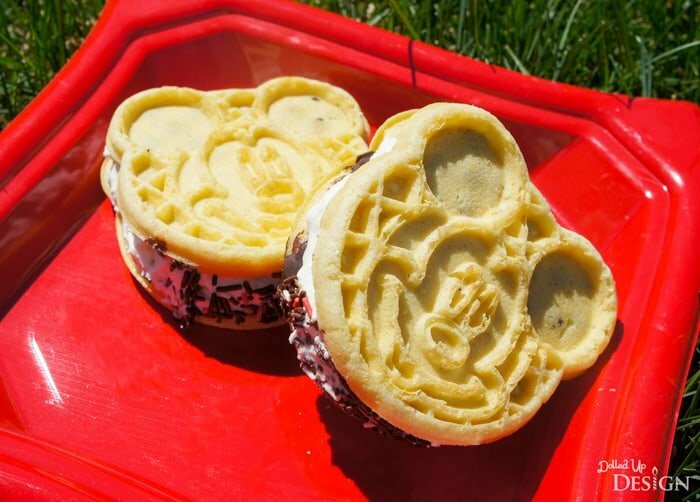 You can’t go wrong with either of these delicious Mickey ice cream treats this summer. We’d like to send a big THANK YOU to Chantelle for sharing these creative ideas with us! Her parties & crafts are always easy to recreate and kids love them! Be sure to follow her on Facebook to stay updated on all her fabulous ideas.